Keep emergency and trauma kits supplied and ready for anything. 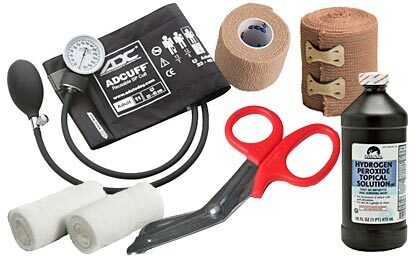 Keep these quality supplies on hand to refit your medical and trauma kits. All the supplies you need to keep your trauma kits and first aid kits fully stocked and ready for your first response team or for emergencies around the workplace or homestead. Single - Dynarex 3680 Triangular Bandage with Safety Clips - 40" x 40" x 56"
Dynarex 3172 Self Adherent Sensi-Wrap 2'' x 5 yds. SafeTec Hydrogen Peroxide Spray 2 oz. Dynarex 1425 Povidone Iodine Surgical Scrub Solution 16 oz. Medi-First First Aid Eye Wash Solution 4 oz. Safetec First Aid Burn Spray 4 oz. DawnMist Instant Hand Sanitizer 4 oz.